Everyone knows Halloween, Halloween II, Prom Night, Terror Train, and The Fog. But one “horror” film from Jamie Lee Curtis’s original scream queen years tends to fall under the radar, mostly because JLC only appears in it for about 20 minutes in total. 1981’s Road Games stars Stacy Keach as a truck driver (although he refuses to admit that) driving down the most desolate roads of Australia to deliver a rig full of pig meat. 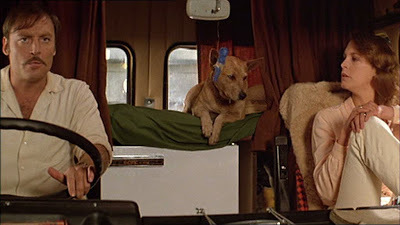 Unfortunately, he nearly witnesses the murder of a woman at a motel and soon finds himself being pursued by a mysterious green van because his dingo (or is it just a dog?) sniffed around the garbage outside the motel. Road Games is the precursor to films like The Hitcher and Joy Ride. It’s a real odd one. To kill time, Stacy talks to himself as he drives, so we get to hear all of his outer monologues. He mysteriously continues to end up on the road with the same cast of driving characters no matter how long he spends making pit stops. He runs into some mysterious rednecks (are they called rednecks in Australia?). He repeatedly passes the same hitchhiker. Thankfully, he finally picks her up 37 minutes into the film. It’s Jamie Lee Curtis, playing pretty much the same exact role she did in The Fog. Together, they contemplate the psyche of the serial killer being talked about repeatedly on the radio. At the same time, it seems the killer is actually framing Stacy while he’s on the road! Only about 20 minutes later, after an awesomely suspenseful scene and a good jump scare, JLC disappears for most of what remains of the film, and Stacy must track down the green truck to find her. Road Games is quirky and almost campy comical at times (JLC gets one of the cheesiest lines at the end of the film), with virtually no gore, an intense scene that takes place in the back of Stacy’s rig, and one of the weirdest final confrontations ever in a horror/suspense film, as well as a tacked on shocker ending that apparently the director was forced to include. It’s also awesomely 80s, with the smart casting of Jamie Lee Curtis, which makes it an essential in…well, MY collection. I don’t care about the deficiency of others’ collections! This entry was posted in Living in the 80s - forever, Movie Times & Television Schedules - Staying Entertained, The Evil of the Thriller - Everything Horror and tagged 1980s, 80s, Jamie Lee Curtis, Road Games, slashers, Stacy Keach. Bookmark the permalink.